Excellent in a drawing room or snug, Peter is a timeless classic. With a wonderful, soufflÌ©e-like rise to the cushions and a low-slung back, this one's a firm favourite and always goes like hot cakes.The Peter chaise allows you to stretch out; an interchangeable ottoman attachment clips underneath the sofa and can be placed on the left or the right. Please note that seams may vary depending on which fabric you choose. The Peter comes in over 100 fabrics, from deep velvets to fresh linens - all home delivered within 5 weeks. Why not include some scatter cushions in the same fabric as your sofa? We offer single cushions and sets of two that'll be delivered directly with your order. With its soft curved lines the Peter collection is timelessly elegant. Designed with a rounded back and plump seat, this is a playfully understated and elegant model with real charm. 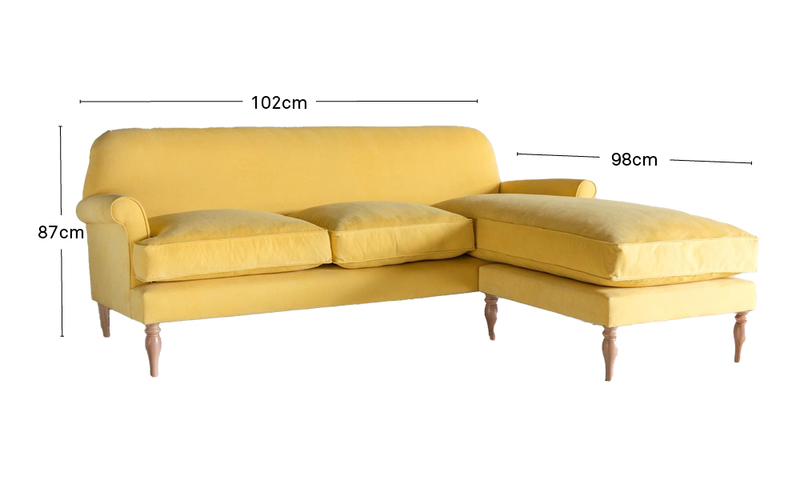 The Peter sofa, chaise and loveseat are all available in a choice of 130 fabrics.